There are breastfeeding facilities in Mothercare, situated on Bromley high street. On the upper level, at the back of the store there are facilities here for mums - There are two rooms, one is a toilet big enough to take your pram in with you, and the other is a baby change room. 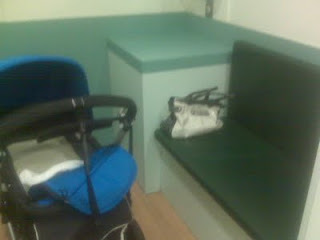 The baby change room has a padded bench for breastfeeding mums to use. There is room here for one mum and her pram. The bench is a bit uncomfortable so be prepared to have a stiff back! Whilst I think it's great that Mothercare have provided an area for breastfeeding mums - I also think it's a shame they didn't think to put one of their own nursing chairs in here! Much more comfortable and also a great way to sell their chairs, especially for the Bromley branch as they don't have the room to put a nursing chair on display on the shop floor and it's an expensive item to take a gamble on and order without seeing it and sitting on one first! Outside both rooms, just in front of the photo studio is another bench set next to bottle warming facilities for bottle nursing mums too!